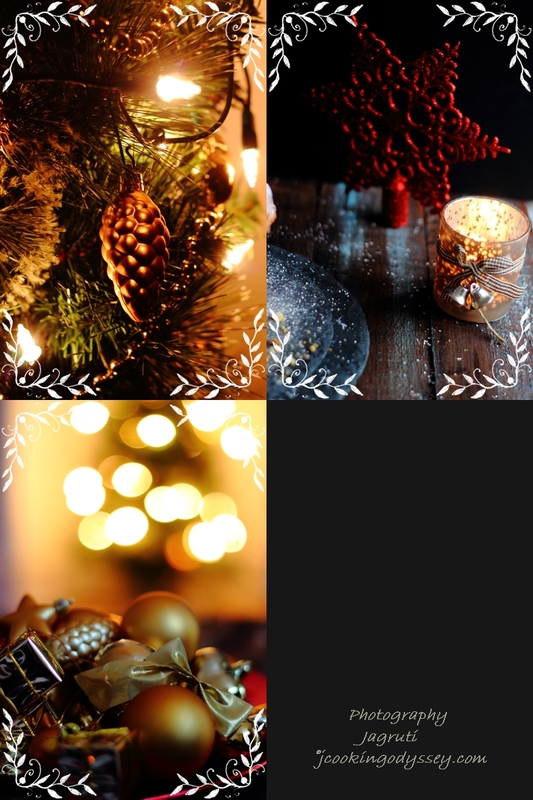 Once again, with the help of a little sparkle and glow, our home has turn into a winter wonderland with all these beautiful Christmas decorations as we always wanted. This year's collection includes some new bought and handmade nostalgic Christmas decorations and we have a little something for everyone in the family - Gold tree baubles in many style adding glitter and sparkle, beautiful scented candles are spreading the cosy-ness and loads of tinsel and fairy lights adding light to the Christmas tree and home . Christmas tree in the sitting room is up and is adorned beautifully and glowing. Yep, finally kids are here and our house is looking a lot like home now, and everyone is in the festive mood. Similar to the glowing house, I am trying to keep the kitchen and my dishes just as glowing and festive! The kitchen and home is smelling heavenly .. Citrus fruits and aromatic spices like ginger, cinnamon and nutmegs keeps the wonderful aroma flowing. Now that whole family together, most of time I am spending in the kitchen, trying some new some old school dishes. 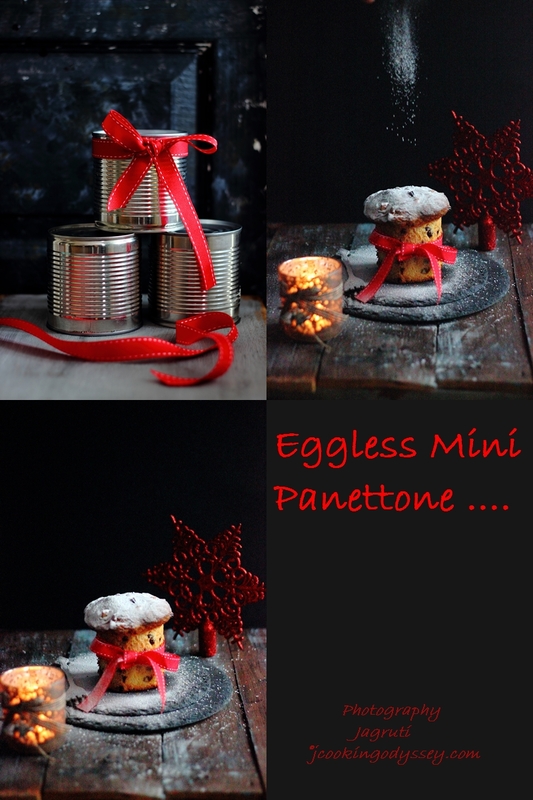 Whilst the tree was going up, I was busy in the kitchen baking Eggless Mini Panettone, It was on to do my list past few years, since I won Panettone few years ago but because of Eggs, I did not try and force myself to make egg less one. Aroma of baking Panettone was delicate, delicious and wonderfully sweet. It took me a while to hang of the recipe as this recipe is little tedious ..instead of making one huge panettone, I made mini ones using metal tins ...turned out super cute and so adorable, everyone started devoured for breakfast with so much joy because these little treats are rich and devilishly buttery and addictive. Panettone is a large, yeasted fruitcake, It's an Italian Christmas Classic and traditionally eaten during Christmas period. 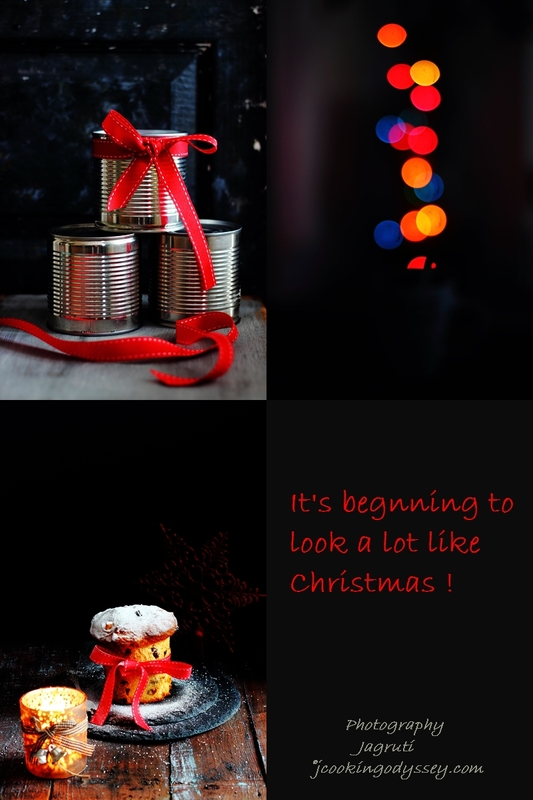 In recent years it has become very popular around the world, and so does on our Christmas table too ! Perfect for a indulgent breakfast or brunch over the Christmas holidays or wrap with festive ribbon or bakers twine and give as a gift, they can make wonderful edible gift!! Mix yeast and warm water in a bowl and let it bubble. It will take less than five minutes if yeast is not gone off. Meanwhile place milk, sugar and butter in a saucepan and let it heat, until just you see bubble around the edges. Let milk mixture cool down a bit, add into yeast mixture. Mix well. Pour this mixture in a big bowl or in stand mixer bowl with dough hook. Add cinnamon, vanilla, salt and orange blossom water. Stir in wheat germ and one cup flour and beat well for minute or two. Gradually add remaining flour and knead the dough for another 5 minutes. Dough will be sticky , place dough in a lightly oiled bowl and cover it with the cling film for 1 or 2 hour or until double in size. Leave bowl in a warm place. When the dough is risen, tip it out on a lightly floured surface and knead the dough for 5 minutes. Gradually knead the raisins, sultanas , cherries and mixed candid peels. Drop large muffin wrap in to 6 clean , 200 g tin. Cut into 6 equal pieces and drop into lined tin. Cover again leave until they are well risen. Heat oven to gas mark 5, Gentle make a cross on top of the risen dough and place 1/2 tsp. butter. Bake for 20 minutes and turn the gas oven down to mark 4 and bake Panettone for 15 minutes or until dark golden. hahaha..yes, i bought few sweet corn tins as baked beans tins are little larger Thanks !